I’m often told that I need to stop judging other parents. That my opinions are offensive and I’m being judgemental. “To each their own” they say and they berate me for “not seeing another way“. There are so many flaws at the root of this concept. I hope you’ll hear me out. Firstly, judgement isn’t all bad. Judgement is a human thing, we all judge. Whether people want to admit it to themselves or not. We all have to judge in order to make decisions. It’s a profoundly important cognitive function, really. Thank goodness we as humans can use this judgement and form values and ideals based on what is meaningful and significant to us. Parenting certainly is meaningful and significant to me. World changing is a phrase I’d use. Like I’ve shared recently, you’re right to question the mainstream parenting paradigm. We need to judge. Without judgement there’s no passion. Without judgement there’s no advocacy and awareness of social issues. Without judgement there’s no change. We are taught in our society that learning right from wrong is so important. Yet when we practice this as adults and determine what is right or wrong, we are judgemental? I think a lot of people thinking judging is inherently disrespectful. We are taught that it’s rude to judge. But it doesn’t have to be disrespectful. I can respect someone’s limitations and empathise with their position while judging their choices because they don’t align with my values. Judge concepts, not people. I think it’s important to judge parenting, not parents. Most parents, we would all agree, are trying their best with what they know. That’s what’s significant about judging the parenting – without judging these choices and helping decipher what’s right and wrong when it comes to children, we all lose. I guess what it comes down to for me as a parent is that I believe all parents should value children’s rights. All parents, in my opinion, should value the respect and autonomy of children. Herein lies where I rub people up the wrong way. Because I value children’s rights over the ego of the parent who is trying to remove said rights. Therefore, simply through advocating for children, my opinion is a judgement of many parents who make choices that remove children’s rights to autonomy and respect. I think that when people are confronted by what advocates for respectful parenting or unschooling are saying, they then say that it’s “judgemental” as a way to belittle and silence the message (whether consciously or not). They’re uncomfortable with questioning their choices and want to use shame and guilt to justify their decisions. We live in a society whose native ‘language’ is disempowerment and disconnection with regards to parenting and education. We are taught from a young age that our thoughts and feelings don’t matter as much as concepts like conformity, obedience, authority, or curriculum. We are conditioned to believe we don’t know what’s best for our own self; that we cannot grow without manipulation via punishment and rewards. When cycle breakers and progressive parents advocate for children and dismantle these damaging parenting paradigms and schooling itself; we are speaking a ‘language’ that’s foreign to most. When they apply it to what they are conditioned to believe and it won’t fit into their framework, it’s easier to dismiss and attempt to silence it. Cognitive dissonance is a profitable ‘condition’. If your values have worth and you live authentically and intentionally by your ideals; then being judged by them won’t hurt or upset you. Because you know your truth and it is something you’re confident in and comfortable with. When your values and ideals align with your actions, you don’t feel judged by people questioning them. When you live by what you believe to be meaningful and right, no one can take that assurance away from you. I know this to be so true for me. I remember when my choices didn’t reflect my ideals and values deep down. I remember the low running hum of discomfort deep down. I know it for past decisions I’ve made and when someone brings up truths surrounding them, I feel that pang. But since I started following my heart a few years ago, and pushed through the cognitive dissonance and discomfort; I no longer relate to feeling uncomfortable when others judge my choices. If I’m judged for say trusting children or not using school, I see the conditioned limitations of the judger, not the judgement. I may defend things as a concept or help educate about where I’m coming from but I’m not defensive. I know our reality and that these things are what children deserve. The thing is, it’s not about judging people for making mistakes, we all make mistakes. It’s about when people straight up don’t believe how they are disrespecting children is a mistake. ‘To each their own’ is a bit of a pet peeve of mine. Yes, all families are different. Yes, all children are different. Yes, we all lead different lives. Yes, we all value different things. But all children deserve respect, regardless. Full stop. Respect shouldn’t be conditional. Children’s freedom shouldn’t be conditional. Children’s unconditional love shouldn’t be conditional (and punitive parenting IS conditional love). ‘To each their own’ should be left to matters of personal preference, not whether a child is respected and loved unconditionally. Circumstances do not change the ideal. While yes there are very rare circumstances where a parent may not be able to fully respect their child, it does not alter the ideal. It does not change that the child deserved respect or autonomy. I wasn’t raised this way. I definitely empathise with how difficult it is to break the cycle and how hard it can be to parent how we want to. Wholeheartedly. I’ve had readers tell me “You don’t even entertain a different opinion!” (on unschooling and parenting without punishment). That hardly seems fair when my opinion is the minority here.. Do people not realise advocates for respectful parenting and unschooling live in the same society where they have grown up around the majority opinion? Most of us raised in the opposite way? It’s not that I won’t entertain your opinion – I’ve heard it countless times and I actually questioned it. I did entertain it.. But realised it’s against my values and isn’t what I want for my family or indeed all children ideally. I am faced with the opposing opinion daily – it’s not new to us. I just don’t agree. It’d be easier in this society if I DID just follow along. But I don’t, and won’t, because this life is too good and I hope more children experience more respect, freedoms, acceptance, trust and autonomy. So I share our different opinion, our opposing choices, in the hope it will resonate with some. I don’t expect it to resonate with many, but those who do hear me are worth it to me. I do think that judging other parenting choices (particularly on a public forum like my blog here) needs to be done out of a place of empathy, kindness and empowerment. I hope that comes across in what I do because that is my intention. I think it’s important to note that empathy and empowerment are only helpful if they’re helping us improve in my opinion. It’s not empowering if we are placating fears and egos. It’s not empowering to dwell in how we all mutually aren’t improving. I think I’ll always be told what I say is judgemental by those who are parenting with control, punishment and disrespect. They want to protect that concept because they don’t want to deal with the guilt of admitting differently. Oftentimes simply stating what children deserve is seen as judgmental and confronting to those who are invested in that paradigm. It’s a delicate between advocating for the rights of children vs empathising with the parents who may not be respecting children, if that makes sense. It’s hard to live loud with opposing beliefs surrounding parenting and schooling because even just making different choices then challenges the reality of others. But I won’t be shamed, guilted or silenced for judging what children deserve from their parents and indeed all of society. I won’t quieten my truth for the comfort of others. I hope you won’t too. I see the empowered parents who have challenged the parenting and educational paradigm because of voices like mine. It’s worth it for every child whose autonomy is respected and every household who is more connected and joyful as a result. You can find us on Facebook and Instagram for more unschooling and parenting inspiration. I find it inspiring that you are living loudly in your beliefs and lifestyle. You are the beginnings of a movement that is changing the way we treat our children and it is a growing movement because it produces beautiful capable people. Judgement is part of life like you say here and there will always be naysayers. More parents need to hear about what you are doing and it will take many times for them to hear before they take notice, possibly listen and make some changes. It’s hard doing something different from an engrained belief system, it takes work, and why so many parents don’t do things differently. Children who grow up respected by their caregivers and adults around them have a high sense of self worth, self-confidence–self esteem. So when they reach adulthood they don’t have to work through so much emotional garbage to be able to live life to the fullest and be successful. It is tough being the trailblazer and living outside the norm, probably feeling isolated much of the time but I’m also sure you’re rewarded everyday with happy healthy children. This is such a lovely comment, thank you! Yes and hooray to all of this Rachel! Facing the truth of what I had done to my children (what was done to me..) broke me, but out of that brokenness something better has been born and is struggling bravely upward… It is all so worth it! Control is always an illusion. Connection is always the answer. All you need is love. I had so much guilt and unlearning and relearning to do and I was already a ‘gentle’ parent when I came to realise what I did wasn’t respectful (we never spanked or did time outs or things like that but some of our language included shame and threats said in ‘nicer’ ways but the principles were still there!) Perhaps I should write about and share that? First off, I love this post. We live in a society right now where voicing your opinion is quickly becoming “bullying” or “shaming” or “not supportive” and while those things most certainly do occur, it seems like simply stating your opinion can wrongfully be labeled as those things very quickly and easily. People have their feelings hurt even when you aren’t saying anything about them. They simply perceive it as an attack on them, usually because they are struggling with their own decisions. Secondly, I would love to have you write about your journey to respectful parenting. It is a journey I am on (and probably always will be) and it can be a tough road full of guilt and shame. As you say, our own childhoods can make for a fight that is difficult to deal with. I lived with a mother who would never lay a hand on me, but she would give me the silent treatment for days. She would say she never said things I knew she had. She demanded respect and obedience or else and she had a layer of ice around her that probably helped contribute to the fiery one I have. None of these are things I do to my children because I hated them so very much. However, I have caught myself doing things in an opposite manner (most likely out of determination not to be like my mother) and often times they aren’t better, just different. At times, I can be quick to explode because it’s “better than not being talked to”. Except it’s not. And I know it so I try every day to be better. Mostly I am. But I am human and it is a struggle and a journey. Which is why I think it would be lovely to hear about someone else’s struggle and journey. It’s nice to know we’re not alone and that no one is perfect and to hear about what helped them. Interestingly, and perhaps because they reflect many of my own values, when I read your posts describing your values, I didn’t think you were commenting on anyone elses parenting methodology in the least. Your comments on others simply trying to ‘silence’ the conversation fit with my exeriences. I love the paragraph on living by your ideals! For me it’s an interesting exercise to examine my feelings as others question what we’re doing. It does in fact help to dtermine what I’m sure is right, vs. what I may need to revisit. I find the same! I agree with and relate to this all too! Yeay to you!!! Thank you for being bold and posting. I avoid sharing my thoughts far too often because I dislike the judgement from others, but perhaps I wasn’t confident in my own beliefs at the time. Thank you! I think it’s normal to want to avoid confrontation regardless of our confidence! I know in a face to face scenario I would rather not talk about these things! In fact the attacks and negativity were part of the reason I took such a long break from regular blogging. I feel strong enough now and am better at using the block and delete functions when someone is simply out to hurt and not grow. I feel a little bit differently. I think your passion obviously comes through. 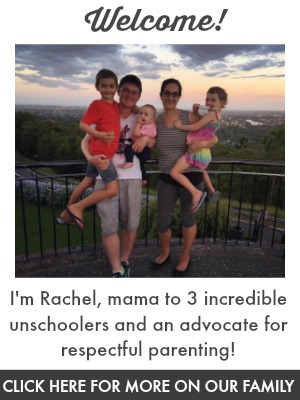 I am passionate about the same things as an unschooling mother of three. My journey is a little different and I certainly didn’t start out thinking I would homeschool my children and we have arrived at this wonderful place quite organically. I had a wonderful childhood, but we are raising our children in a very different way. Step by step I have had to question what i thought was ‘right’. I do find your passionate style of writing to be very direct. I know that is the point, but I also know that you would have alienated me in the beginning. When you confront people with an ‘everything you know and are doing is wrong’ approach, it is a natural response for people to be defensive. If you approached this with the same empathy you provide your children when they are struggling or failing at something, you might access a much larger audience and inspire so much more change. I love and respect what you are doing. I can also see why you sometimes get those responses. It seems to resonate with many and sometimes people just aren’t ready regardless. I know there was a time I wouldn’t have been too. You can see the progression in my writing over the years. Thank you though, I do really appreciate your honesty! Just by us making less common parenting choices, people often feel judged. Like you said, it might come from a deep feeling of discomfort with their own choices. Most people just don’t dare going against the stream. We need to keep walking our path and talk about it with empathy and respect to all. Thank you for putting thoughts into words. Thank you. Yes it’s hard choosing so differently, finding like minded friends was a really significant part in my strength with this lifestyle. Thank you for blogging again and advocating for all children! I love your new (and old) posts. Especially this one is great as we are within an long term argument about our parenting style with my parents. They do not feel appreciated anymore for everything they have done for me and my brother and sister. Also they fear, that our children might struggle in society if they grow up being free to be themselves. But even if this argument takes a lot of strength, it makes me even more convinced of our path. And your posts do the same. These things need to be said/written and every voice advocating for children counts. Baby-step by baby-step this thoughts will get less offensive and more normal! Too true! We deal with similar. Thank you! This post resonated with me. My neighbours for the most part speak to their children in a manner that makes me feel so sad for the young ones. After reading this, I do feel more confident in saying that yes I do judge them, and I would also judge them if they hit their kids. Emotional abuse can be more damaging than physical, I am in my 40s and still battling the coercive parent in my life, mentally and verbally if she is out of order with my son. I need to channel my inner warrior and be more outspoken. Thank you! This is amazing! Sound logic and very clear. I love voices who point out things like this to me, so I can improve my own life and refine my thinking. This definitely changes how I think of the concept of judging others. I am new to this blog and so far the things I’ve read have been incredible! I came back to this post as I have a friend who’s behaving toward her daughter in a way I feel quite uncomfortable with – pressuring her in various ways to eat more at dinner – but I don’t know how to talk to her about it, I think at least partly because, as you write, judging other parents is considered off limits.